COLUMBUS, Ind. - Toyota Material Handling, U.S.A., Inc. (TMHU), the supplier of the numberone selling lift truck in North America furthered its philanthropic efforts this year by donating an internal combustion lift truck to The Midwest Food Bank of Indianapolis, Ind. The Midwest Food Bank is committed to serving those throughout the state of Indiana. 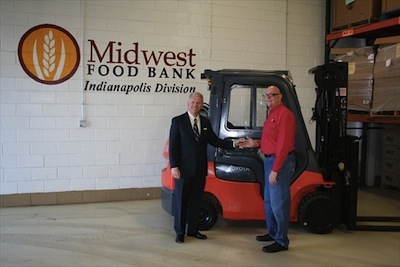 The donated Toyota forklift, which was manufactured approximately 40 minutes away at Toyota Industrial Equipment Mfg., Inc. (TIEM) in Columbus, Ind., will handle the loading and unloading of food and supplies used to help feed an estimated 60,000 individuals through 230 agencies. "This gift will allow us to continue delivering food to those in need both here in Indiana and to other states recovering from natural disasters," said John Whitaker, director of operations for the food bank. "Often times much needed material handling equipment is a luxury for resource-constrained, not-for-profit groups," said Jeff Rufener, president of TMHU. "Toyota is honored that our locally made forklift will assist this worthy organization in serving those in need throughout the state." Toyota has become the industry leader through unparalleled quality of engineering design, coupled with leading-edge manufacturing capabilities. In 1990, TIEM became the first Toyota lift truck manufacturing plant outside of Japan. Since the first lift truck rolled off the line 23 years ago, TIEM associates have built more than 400,000 lift trucks and Toyota has steadily penetrated the U.S. market to achieve the ranking of the number one selling lift truck since 2002. Today, the vast majority of Toyota lift trucks sold in North America are produced at TIEM.